Alexander Gray Associates is pleased to announce representation of the Estate of Betty Parsons (b.1900, New York City, NY – d.1982, Southold, NY), with the Gallery’s first exhibition of her work opening May 24, 2017. Parsons was an abstract painter and sculptor who is best known as a dealer of mid-century art. Throughout her storied career as a gallerist, she maintained a rigorous artistic practice, painting during her weekends in her Long Island studio. Parsons’ eye for innovative talent stemmed from her own training as an artist and guided her commitment to new and emerging artists of her time, impacting the canon of Twentieth-Century art in America. Parsons was drawn to art at an early age when in 1913 she attended the Armory Show in New York City. As she came of age, she became dissatisfied with the traditional models of education and limited occupations for women at the time. Following the dissolution of her marriage to Schuyler Livingston Parsons in 1923, she moved to Paris and studied painting and sculpture with School of Paris figures, including Ossip Zadkine and Alexander Archipenko. Her ten years in Paris centered around the ex-patriate community of lesbian artists and cultural figures, including Gertrude Stein, Sylvia Beach, and Adge Baker, in pursuit of a life in art. Upon her return to the United States in 1933, Parsons continued to create, spending time in California and New York. In 1935, she had her first solo exhibition of paintings at Midtown Galleries, New York, and following this show, she was offered a job installing works and selling paintings on commission, sparking her curatorial interest and developing her professional identity as an art dealer. In 1946, Parsons opened her eponymous gallery, and after the closure of Peggy Guggenheim’s Art of This Century Gallery in 1947, she inherited Guggenheim’s roster of artists, including Barnett Newman, Mark Rothko, Jackson Pollock, and Clyfford Still. While her gallery’s legacy is closely tied to these leading figures, Parsons also championed a diverse program of artists, showcasing work by women, gays and artists of color, reflecting her liberal and inclusive values, and eclectic tastes. While operating her gallery, she continued to make art. 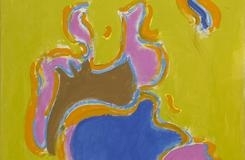 Following her formal training as a sculptor and landscape watercolorist, Parsons made a stylistic departure in 1947 when she began to work abstractly to capture what she called “sheer energy” and “the new spirit.” From the late 1940s onward, her paintings conveyed her passion for spontaneity and creative play through impulsive gestural brushstrokes and organic forms. She utilized thin layers of vibrant paint, often allowing the surface of the canvas to remain visible. Parsons had a long interest in ancient and ethnographic arts, as well as mystical and non-Western spiritual practices, including meditation. Through these interests, she chose to set aside the rigid theoretical framework of contemporary abstraction, allowing instead for expressive improvisation in her paintings. Throughout her life, Parsons traveled widely in pursuit of new influences, taking frequent trips to Mexico, France, Italy, Africa, and Japan. She meticulously recorded her travels in her journals as watercolors and sketches, and often drew on a sense of place in her work. In the 1960s, Parsons would increase her time in Long Island, having built a painting studio designed by the sculptor Tony Smith, perched above the Long Island Sound. Her weekends would be consumed by observing nature, and her painting became increasingly saturated with color. In addition to painting, in the late 1970s she returned to sculpture, making polychrome assemblages of discarded wood and driftwood she would collect on the beach. In 1968, the Whitechapel Gallery in London presented a solo exhibition of her paintings; in 1974, the Montclair Art Museum, Montclair, NJ, would present a retrospective exhibition. Parsons died in 1982, a year after closing her 57th Street gallery, leaving a multi-faceted legacy as a woman, and an artist, of the Twentieth Century. Posthumously, Parsons’ work was explored in a solo exhibition at the Pollock-Krasner House and Study Center in East Hampton (1992), and in numerous gallery exhibitions. Largely overlooked during her lifetime, her work is in prominent public collections including The Whitney Museum of American Art, New York, NY; The Smithsonian American Art Museum, Washington, DC; The Museum of Modern Art, New York, NY; The Carnegie Museum of Art, Pittsburgh, PA; The National Museum of Women in the Arts, Washington, DC; The Parrish Art Museum, Water Mill, NY; The Montclair Museum of Art, Montclair, NJ; and The High Museum, Atlanta, GA; among others.